Protect and nurture your furry friends with radiating nurturing energy. petDOT radiates a natural energy which supports your pets’ energy field all day every day. Attach the petDOT to your dogs collar, a bridle or another item your pet wears. Stick the aquaDOT to their water bowl. Animals need protection too! Protect and nurture your little friends with our combination pack consisting of both a petDOT and an aquaDOT. As animal lovers we all want to care for our pets in the best way possible, but it can sometimes be easy to forget that they too are being exposed to the electromagnetic emissions and radiation that surrounds us, and that they are also being detrimentally affected by this type of pollution! Animals can be highly sensitive to emissions from our much loved gadgets. Electro-magnetic frequencies constantly bombard them and interfere with their natural energy. Sticking a petDOT on their collar, halter or other item that they wear can help protect and support them from the harmful effects of these gadgets and possibly help boost their natural energy and zest for life! 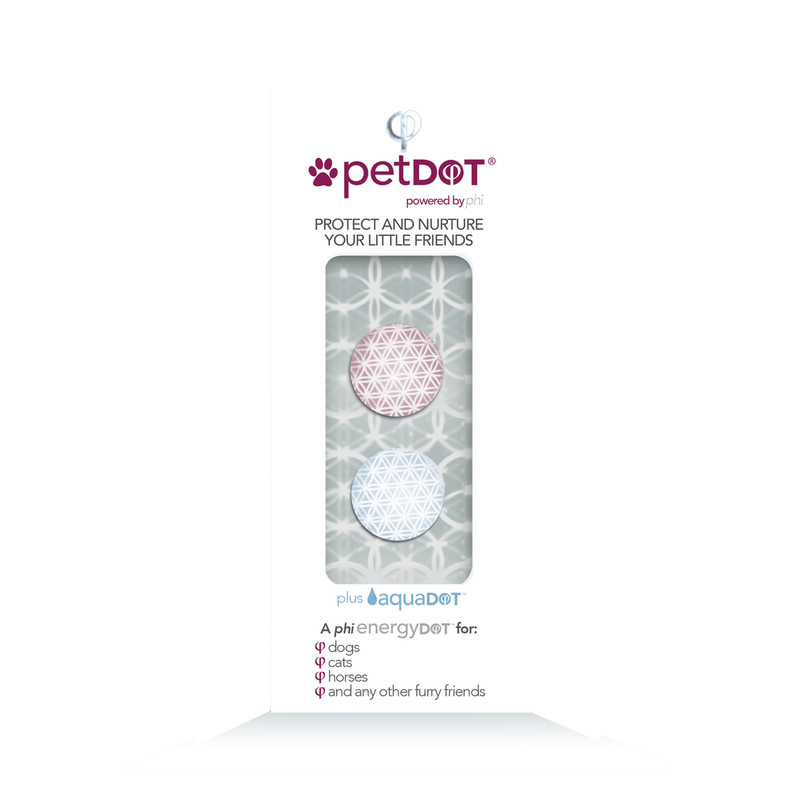 petDOT holds and radiates a nurturing energy signature (phi technology) which strengthens and supports your pets natural energy field – helping your pet stay on top form. And don’t forget their water! Just as it is vital to our health that our bodies get plenty of clean, revitalizing water to keep us hydrated, so is it for our animals. Because the energy structure of water is distorted by exposure to electro-magnetic frequencies we include the aquaDOT with your petDOT pack. The positive natural energy signature that the aquaDOT radiates will refresh the energetic structure of water so that you can ensure that the water they drink can help them stay healthy.